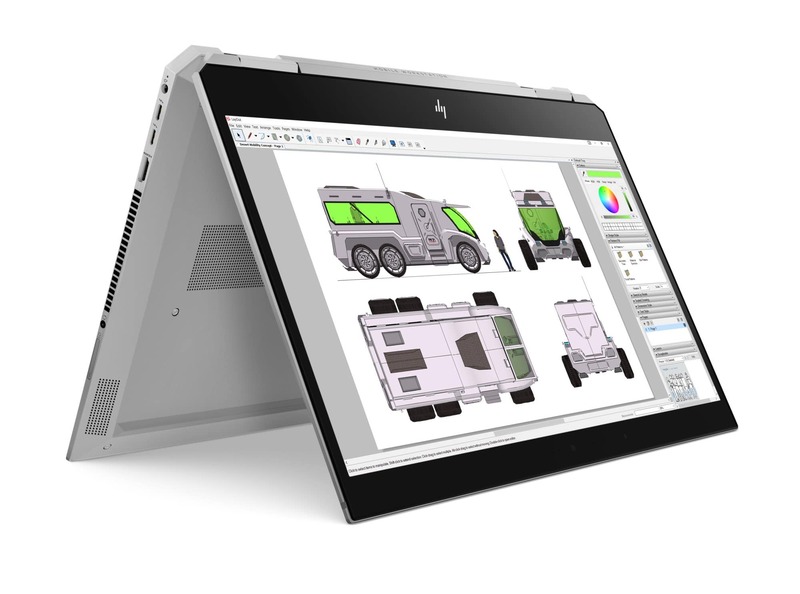 HP ZBook Studio x360, Laptop For Creators and Designers! As part of the release of Intel Core 8th Generation Coffee Lake processors, Hewlett-Packard launches its new Zbook Studio x360 Coffee Lake and Zbook x2 Kaby Lake Refresh 2-in-1 Ultrabooks with tablet PCs, multi-touch touch screens, compact hybrid notebooks docking style. Featuring an aluminum chassis, the HP Zbook Studio x360 features a backlit, splash-proof, chiclet keyboard. Adopting a 15.6-inch format, it measures 360 x 254 x 20mm, weighs 2.26 Kg and has a 4-cell 64Whr Li-Ion battery, a 95.6Whr 6-cell Li-Polymer battery option is planned. It runs Windows 10 (Pro), FreeDOS 2.0, Ubuntu 16.04.3 LTS or Red Hat Enterprise Linux 7. This 2-in-1 Ultrabook stands out with its 360-degree multitouch touch screen that can be turned into a tablet. With a protective layer Corning Gorilla Glass 4, the screen can adopt several different characteristics. Thus, we are dealing with a 400 cd / m² IPS screen is Full HD (1920×1080) or 4K (3840×2160) with ambient light sensor technology (ambient light sensor). Or a full HD IPS 650 cd / m² with Sure View technology or a IPS 4K 600 cd / m² 100% sRGB DreamColor capable of reproducing 1 billion colors. The HP Zbook Studio x360 is built around a latest-generation Coffee Lake Quad Core processor i5-8300H (2.6GHz), Quad Core i5-8400H (2.5GHz), Hexa Core i7-8750H (2.2GHz) or Hexa Core i7 -8850H (2.6 GHz) with Intel UHD 630 graphics solution, or a Xeon E-2176M (2.7 GHz, 6 cores) or Xeon E-2186M (2.9 GHz, 6 cores) with Intel UHD P630 graphics. On the storage side, Hewlett-Packard is planning a dedicated 256 GB 1 TB SSD (security or non-encrypted data option) in M.2 SATA format, or 256 GB to 2 TB (security option or not) at M.2 NVMePCIe format . 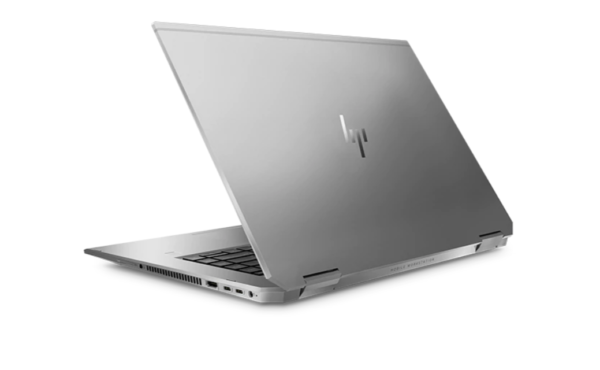 The HP Zbook Studio x360 Hybrid Ultrabook also includes up to 32GB DDR4-266MHz RAM (2 slots), 2 Bang & Olufsen speakers, a 720p HD 720p infrared webcam that is compatible with Windows Hello, a fingerprint reader, an SD / SDHC / SDXC card reader or a 4G / LTE connection (option), Wi-Fi ac 2×2 (Intel Dual Band Wireless-AC 9560), Bluetooth 5.0, HDMI 2.0, Headphone / Mic combo, 2 USB 3.0 ( 1 loadable) and 2 USB 3.1 Type-C (Gen2) Thunderbolt 3 (DisplayPort 1.3). 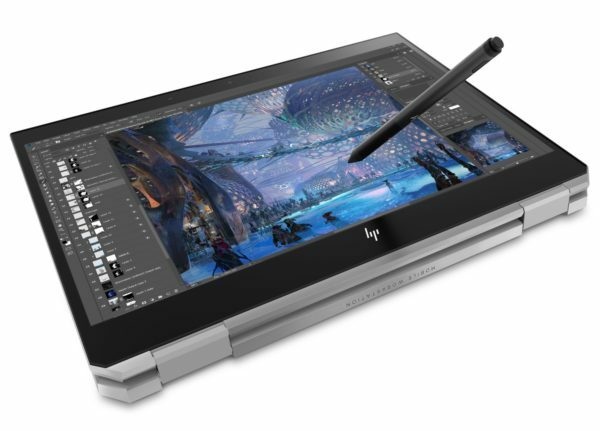 Across the Atlantic, the HP Zbook Studio x360 2-in-1 Ultrabook is expected around May / June for $ 1499. 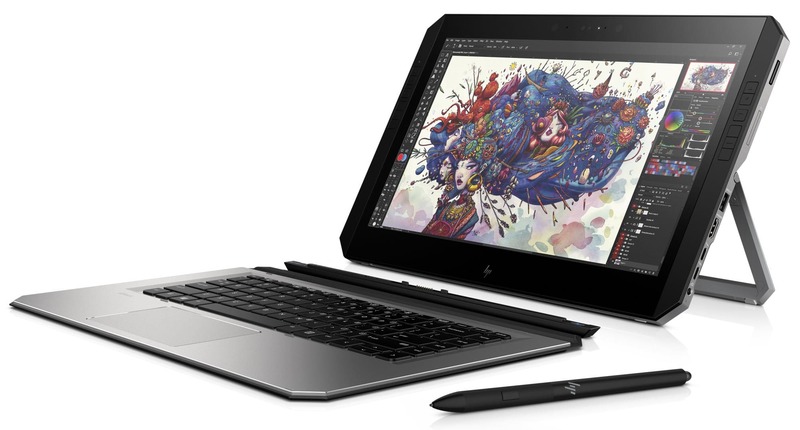 The HP Zbook x2 G4 can also turn into a tablet with its keyboard completely detachable screen obviously with touch technology multi-touch. A pen ZBook x2 pen (4000 pressure points) is also provided. The screen precisely is a 14-inch model with or without DreamColor technology and adopting in all cases a definition Ultra HD 4K (3840×2160). A 720p infrared HD webcam is present at the front and an 8 megapixel model at the back. It houses all the connectivity including Wi-Fi wireless ac modules (Intel Dual Band Wireless 8265) and Bluetooth 4.2 with optional 4G, an HDMI 1.4 video output, a headphone / microphone combo audio port, 1 USB 3.0 ( loadable) as well as 2 USB 3.1 Type-C (Gen2) Thunderbolt 3 (DisplayPort 1.2). The chiclet keyboard has a backlighting system. The set works with a li-Polymer 70Whr battery offering an announced autonomy of 10 hours . 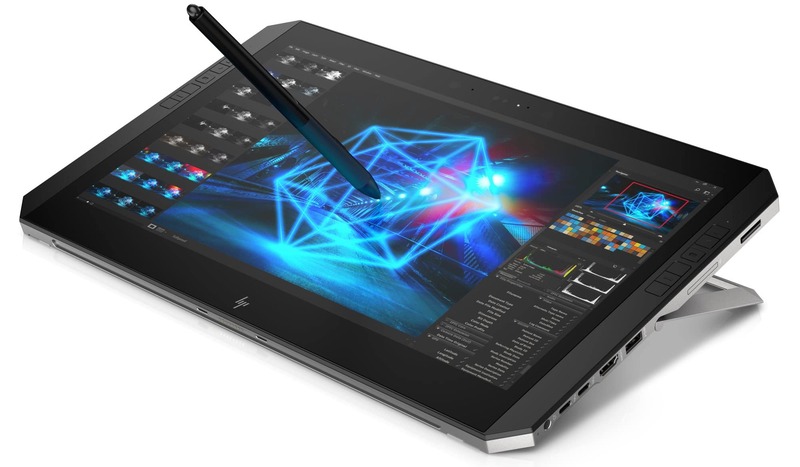 Only the screen weighs 1.65 Kg for dimensions of 364.5 x 227.1 x 13.46 mm, against 2.17 Kg in PC mode (364.5 x 227.1 x 19.05 mm). 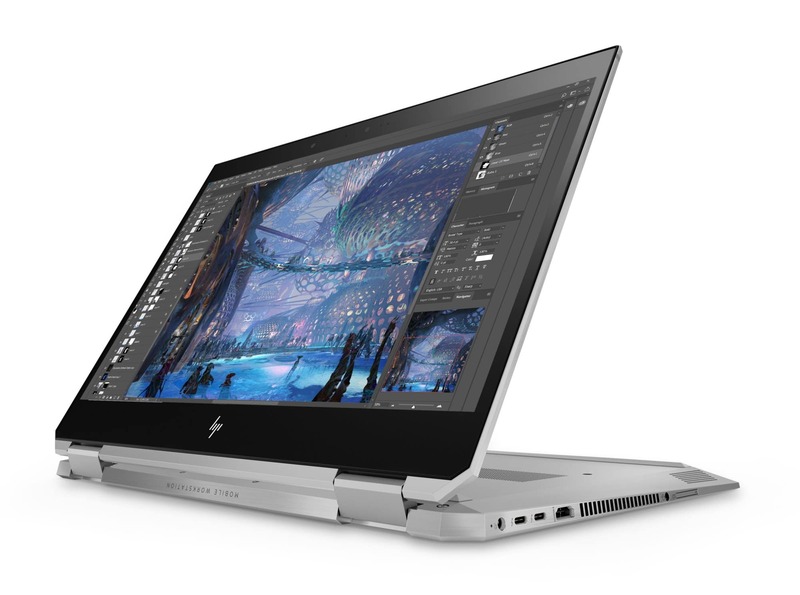 But while Intel also launched a range of low-power Coffee Lake processors a few days ago, Hewlett-Packard here opts for a Kaby Lake Core I5-8250U (1.6GHz) Core i7-8550U (1.8GHz) ) or Core i7-8650U (1.9 GHz) to Intel UHD 620 graphics solution. 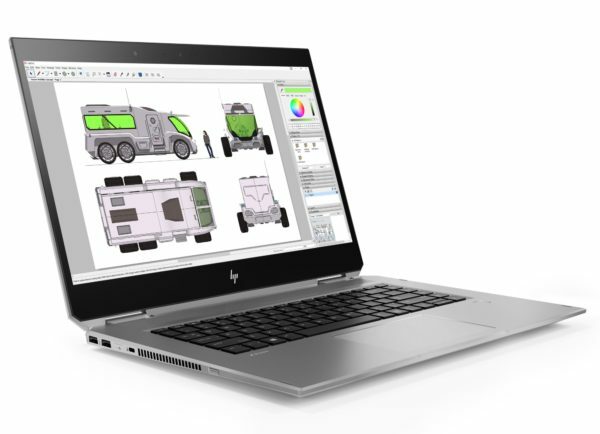 For the rest, the HP Zbook x2 G4 has up to 32GB DDR4 2133MHz RAM, a Bang & Olufsen 2-speaker sound solution, or a 128GB or 512GB M.2 SATA dedicated SSD storage, and M .2 NVEMePCIe 256 GB to 2 TB, with or without security option (data encryption). 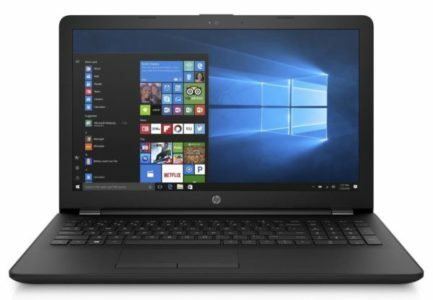 The HP Zbook x2 G4 appears from 1799 dollars in the United States.